HILTON HEAD ISLAND, S.C., October 2, 2018 -- Tickets for the 12thannual Hilton Head Island Seafood Festival are now on sale. The coastal region's weeklong gourmand experience offers a heady mix of top chefs, sommeliers, mixologists, local seafood, artisans and musicians, who come together for an outstanding offering of palate-pleasing events returns to Hilton Head Island, February 18-24, 2019. 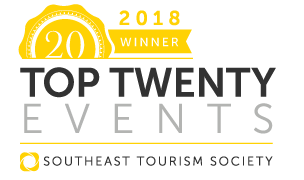 Come celebrate the South’s evolving culinary culture as the best of world-class talent comes together for food and drink! Long before the countless celebrity chefs and pitmasters descend on Hilton Head Island, the David M. Carmines Memorial Foundation announced their $135,000 donation to local charities. Since 2004, just over $645,000 has been donated to area charities. 2018 Festival events hosted a record number of attendees – 13,000 over the course of seven days in February. The economic impact estimated at $6 million for the Island and growing year over year. From the bountiful Lowcountry setting, with an opportunity to get up close, both on the water and around the burning fire embers of reigning pitmasters – the Hilton Head Island Seafood Festival’s schedule of events is available online with tickets to marquee events such as the Celebrity Chef Tour Dinner hosted by the Omni Hilton Head Oceanfront Resort, Lowcountry Seafood Experience on the Water, Pitmaster 101, Pig Pickin' & Oyster Roast at Waddell Mariculture Center, Saturday Seafood Festival at Historic Honey Horn Plantation and Seafood, Champagne + Gullah Sunday Brunch. ABOUT THE DAVID M. CARMINES MEMORIAL FOUNDATION: The David M. Carmines Memorial Foundation, a 501c3 non-profit organization, helps raise funds for non-profit organizations throughout the state of South Carolina including the Coastal Discovery Museum, Port Royal Sound Foundation, Gullah Heritage Museum, Island Recreation Scholarship Fund, American Cancer Society, MD Anderson Cancer Research Center, Reverend Isaac. Wilborn Jr. Scholarship Fund, Volunteers in Medicine, Waddell Mariculture Center, Coastal Conservation League, Children’s Center and the Medical University of South Carolina Foundation. The David M. Carmines Memorial Foundation was established by the Carmines family, owners of Hudson's Seafood House on the Docks, in memory of their son, and the seafood festival is the organization's main fundraiser. ABOUT THE HILTON HEAD ISLAND SEAFOOD FESTIVAL: The 12thannual Hilton Head Island Seafood Festival presented by Publix is thecoastal region's weeklong gourmand experience that offers a heady mix of top celebrity chefs, sommeliers, authors mixologists, local seafood, artisans and musicians, who come together for an outstanding offering of palate-pleasing events February 18-24, 2019. Proceeds from the Festival benefit the David M. Carmines Foundation each year. To purchase tickets and for more details go to HiltonHeadSeafoodFestival.com.